9.00 a.m. – 9.40 a.m.
9.50 a.m. – 10.30 a.m.
10.50 a.m. – 11.30 a.m.
11.40 a.m. – 12.20 p.m.
Dale Edwards until earlier this year was Chief Executive of Somerset Chamber of Commerce a position which he held for over two and half years. 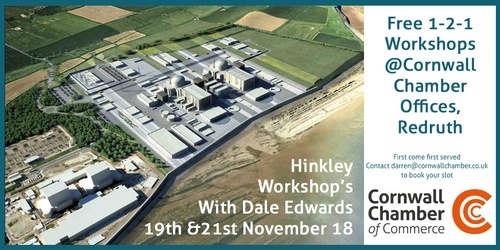 During his time at the Chamber Dale was heavily involved in the Hinkley Supply Chain delivering a supply chain solution for EDF and its contractors by engaging with both Somerset and South West businesses that want to become part of the building of Hinkley Point C.
EDF recently announced that £1.3bn of contracts have been awarded to South West firms to date, with many more work packages and contracts available. Since leaving the Chamber he has partnered with Clarke Willmott LLP as a Strategic Consultant for Nuclear Energy and Infrastructure to help maximise opportunities at Hinkley and the emerging new nuclear sector, bringing a wealth of knowledge and contacts. Some Cornwall Chamber members may recall Dale presented at a Chamber lunch 18 months ago outlining the scale and opportunities available. 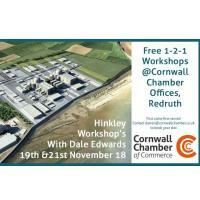 Dale has offered to base himself out of Cornwall Chamber HQ in Redruth for FREE 1-2-1 workshops for Chamber members and any other Cornish business who want to know more about the opportunities for their business at HPC. The objectives are; provide a short overview of the HPC project; get to know what the business does and see where, when and if there is a potential opportunity; signpost to relevant organisations or people; and see what if anything that Clarke Willmott can assist with. Each workshop will last a maximum of 40 minutes and will be filled on a first come first served basis.